Super versatile & flattering...our favorite pants of the season! Our new slim plus size pants are chic, comfy and a fashion find. 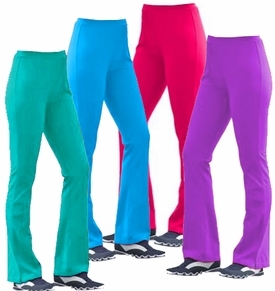 These pants have a slim fit and an elastic waist and hem slits. Washable cotton/spandex, imported. 2x: Waist = 44/46", Hips = 52/54"
3x: Waist = 48/50", Hips = 56/58"
4x: Waist = 52/54", Hips = 60/62"
5x: Waist = 56/58", Hips = 64/66"